In reality, their is not something called “darkness” that can be measured. All that exists is light. What we perceive as light and darkness is actually the presence or absence of light. That is why darkness cannot push out light, and light is always superior. The purpose of light is to give illumination to everything around. 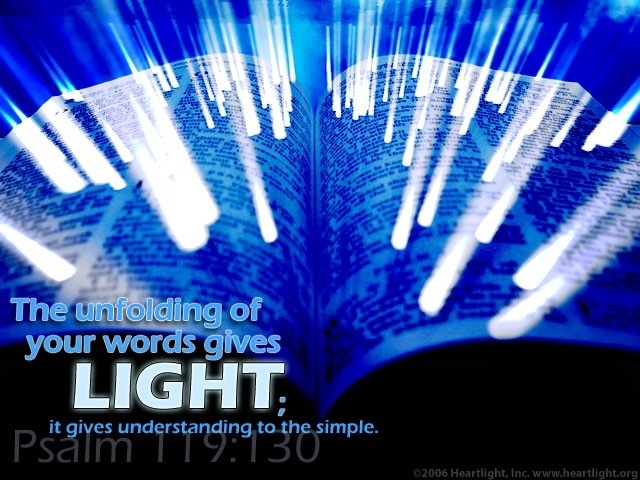 In Psalm 119, the word says “The entrance of Your words gives light; It gives understanding to the simple. (Psalm 119:130 NKJV). And the apostle John wrote about light in the New Testament. This is the message which we have heard from Him and declare to you, that God is light and in Him is no darkness at all. If we say that we have fellowship with Him, and walk in darkness, we lie and do not practice the truth. But if we walk in the light as He is in the light, we have fellowship with one another, and the blood of Jesus Christ His Son cleanses us from all sin. (1 John 1:5-7 NKJV). So walking in the light is critical for our spiritual survival. But we have to be purposeful about it. Seeing the light is not enough. We must walk in it, for only then will we be able to see the way to go, and be able to recognize sin in our lives so that we can repent and be healed. That’s why Jesus said to be careful how you listen. We must listen in faith, and take action on what we hear. If we don’t, we we have what little spiritual knowledge we think we have taken from us. We have free will, and can reject light because we find it uncomfortable. Jesus said that light rejection is the reason sinners reject His Gospel. And this is the condemnation, that the light has come into the world, and men loved darkness rather than light, because their deeds were evil. For everyone practicing evil hates the light and does not come to the light, lest his deeds should be exposed. But he who does the truth comes to the light, that his deeds may be clearly seen, that they have been done in God. (John 3:19-21 NKJV). This particularly ironic since in our text in Luke Jesus said that everything will be revealed and be exposed. So what are we trying to accomplish by hiding our sin and hoping to get away with something. At some point in time, our sin will be exposed. It is better to let the Word of God reveal it to us so we can confess it and repent, rather than to be publicly shamed when it is revealed. So walk in the light of the Word and let it do its work in you. « Why Is There A Universe?